Optional get-together at the hotel restaurant Cuckoo's Nest at Radisson BLU Riverside Hotel next to the conference venue at Lindholmen. This is optional for those who want to meet and mingle the evening before the conference starts. The Cuckoo’s Nest has a very special interior and is nominated for an award for this. Here you can buy food and drinks and enjoy the view of the dock. 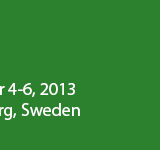 DDI2013 offers two Technical Visits on Thursday September 5th at 17.30: VTI’s Driving Simulator Sim 4, and Smart Eye. Please sign up at the reception desk! If you want to visit both, please join to VTI first, and then to Smart Eye who will show you the way. The driving simulator Sim 4 has an advanced motion system and permit significant linear movement along both x and y axes. It is the first choice when simultaneous longitudinal and lateral acceleration is important or if a wide field of vision is prioritised. The simulator has both a passenger car compartment and a truck cab. It has three LCD displays for rear-view mirrors and a visual system comprising nine projectors. The visual system gives the driver a 210-degree forward field of vision. The simulator's imaging system has a camera-based calibration system, making it easy to switch between different driver positions. The simulator is within walking distance from the venue. Tour starts: 17:30 from the conference venue. Smart Eye develops real-time and completely non-invasive eye, eyelid and head tracking technology. Their headquarters is located in Gothenburg at Första Långgatan 28B (just at the opposite site of the river Götaälven). You are welcome to experience a totally different kind of distraction – in form of music, mingle, food and drinks partly served from an eye-controlled bar, the “Drinkmaster 5000”. Of course you will also have the opportunity to see Smart Eye’s eye tracking solutions in action and have a chat with the Smart Eye-Team and get to know their working environment. Free ferry ride to Första Långgatan 28B. Tour starts 17:30 and 18:30 from the conference venue. Workshop on Naturalistic Cycling Analysis. Free of charge but mandatory registration.